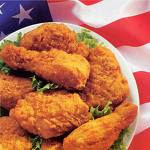 OK, so I don't know who all is reading this blog...but could someone give me a REALLY good fried chicken recipe? Like, an amazing Southern recipe, with the skin, and not robbed of it's purity, but one that is not as difficult and time consuming as an Alton Brown recipe, or as easy as driving to KFC, or as annoying as a Martha Stewart recipe, or as artery-cloggingly dangerous as a Paula Dean recipe...maybe something between a Bobby Flay and Rachael Ray recipe?? Is that even possible? i cannot. as i have not. a recipe, that is. but i can tell you to add mayernaise.